1.2 How do we cook cilantro? Cilantro or coriander (Coriandrum sativum) is a plant of the Umbelliferae family, related botanically with parsley. Cilantro flavor is pungent, spicy, with and strong citrus aroma. This aromatic herb is used in cooking around the world: China, Middle East, Africa, Asia, Europe and Mexico, where it is known as Chinese parsley. Cilantro word generally refers to the leaves, specially in South America, whereas coriander generally corresponds to the same plant seeds. These seeds are used in curries and marinades. How do we cook cilantro? Cilantro is used fresh, as it was chopped parsley. Added to the end of a preparation, it gives a loud and very distinctive flavor. Do not add during cooking: Heat destroys its aroma and can sour dishes. For the presentation of dishes, you can place a bunch or a few fresh leaves decoration. For example, it is use to decorate the guacamole sauce. Store at room temperature in a jar or glass of water, or in the refrigerator in an airtight container. Cilantro leaves are rich in vitamin C, chlorophyll, quercetin and rutin. These components give antioxidant properties,so this herb helps preserve food flavored . In the body,cilantro has a similar function to prevent premature aging. Antioxidants protect cholesterol from degradation and prevent the formation of arteriosclerosis, which is the deposition of atheromatous plaque that accumulates in the arteries. Scientific studies have proven that cilantro helps to reduce cholesterol. Vitamin C provides properties to prevent anemia (increases iron absorption) and to improve the health of the joints and skin (helps form collagen). According to Iranian traditional medicine, coriander is anxiolytic to calm nerves and anxiety. Hypoglycemic effects of cilantro help control the level of blood sugar after meals. Coriander is rich in chromium (mineral that enhances insulin function), niacin, chlorogenic acid, quercetin are also (hypoglycemic) since they stimulate the production of insulin by the pancreas. These properties make it a very suitable herb for people with diabetes. It has diuretic properties that make it suitable in cases of fluid retention, or cellulite in women with premenstrual syndrome. 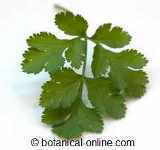 The essential oil of cilantro combats rheumatism, fatigue, fever and pain. This herb has also been attributed with aphrodisiac properties. Cuisine of Mexico: One of the dishes is the guacamole, avocado sauce and vegetables are raw, which gives cilantro flavor. Prepare 2 large avocados, five tomatoes, half an onion, 1 clove garlic, green chile, cilantro and salt. Cilantro is a very typical ingredient of Mexican cuisine, which is also used for mole tacos, salads, rice dishes, meat, fish, etc.. Cuisine of India: It appears in very different uses, one of the most popular is in the chutney (Dhania Hari Chatni). It is a green sauce made with a bunch of cilantro, ground cashews, a little ginger, yogurt, lemon juice, honey and salt. Grind all the ingredients and sauce to accompany rice, vegetables and meat dishes are served. Also used in stews, rice dishes, vegetables, in typical lentil dal, etc. Cuisine of Vietnam and other Southeast Asian countries: an aromatic herb is widely used for the preparation of curry sauce, rice, salads, soups and stews. Cuisine of Peru: A must for developing the traditional ceviche ingredient. Cuisine of Venezuela: A typical ingredient for this country gravy, the Guasacaca. It is prepared with avocado, onion, cilantro, peppers (chili) green, garlic, oil, white vinegar and black pepper.